Breeder of the Month for August 2017! Happy Thursday everyone! Its the very last day of the month and we have so much excitement going on! 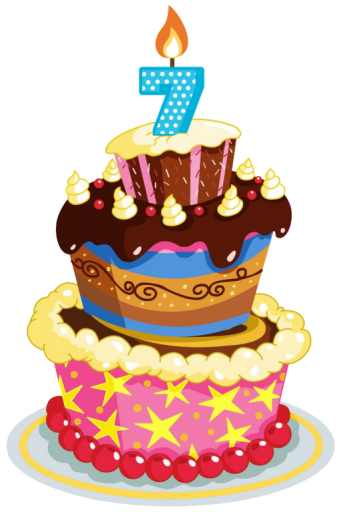 Tomorrow we will celebrate Amaretto being in Second Life for 7 years and counting! I mentioned at the start of the month that i would be picking 1 breeder to be breeder of the month! Well it is time to announce our first Amaretto Breeder of the Month! Petr Hastings-Vanbeeck (Petr Vanbeeck)! I choose Petr to be this months Breeder of the Month! Petr has been breeding in Amaretto for a number of years! He knows his Amaretto stuff so well that he was once a mod. Petr is always very helpful in the group and it doesn’t matter which one! Petr has breed everything from K-9s, Barnyard Birds, to Horses, and now Ponies! I choose Petr to be this months Breeder of the Month because he is always so helpful and kind. Petr is the kind of breeder that Amaretto needs someone kind, helpful, and always up to something new! Congrats Petr! If you guys see him in the group or at a market or auction be sure to say hello! Remember Ava’s eyes are always watching for next months Breeder of the Month. 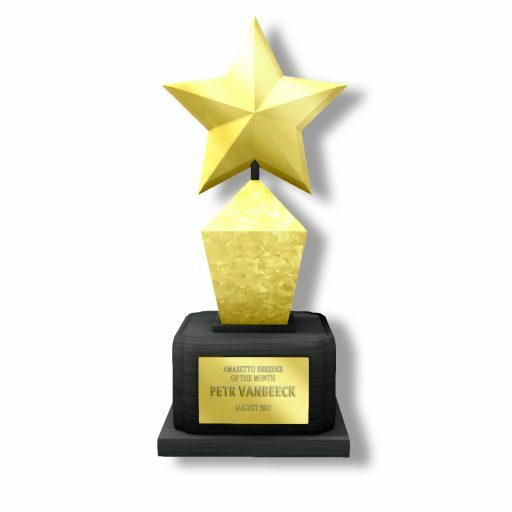 Petr has received this trophy and a really awesome prize pack from Amaretto! I am so excited for tomorrows festivities hope to see all of you out there! Happy breeding everyone this is Ava over and out! Wayback Wednesday: A blast from the past! Can you believe we are mere days away from Amaretto’s seventh birthday? To commemorate the occasion, I thought a blast from the past was in order. …and go back to 2011. Now, fast forward to Amaretto in 2017. After MUCH anticipation, the newest member of the breedable family, Ponie Pals, were introduced in June of this year. Wow! With horses, K9s, birds and ponies, Amaretto Ranch is clearly a driving force in the breedables industry of Second Life. I am so happy to be a member of this Community. I hope you will join me in wishing them continued success in the years to come. Till next time….HAPPY BIRTHDAY & HAPPY BREEDING! 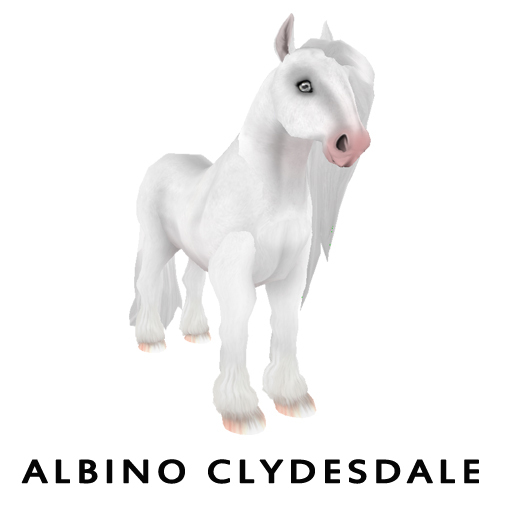 The Albino Clydesdale come randomly from full siblings. In order for a chance at an Albino Clydesdale one of these full siblings MUST BE a Clydesdale. Full siblings are siblings that come from the exact same mother and father. Siblings do not have to have the same traits they only need to be full sibling. The Albino Clydesdale coat does NOT pass. However, breeding an Albino Clydesdale with it’s sibling does slightly increase your chance for another Albino or Albino Clydesdale. The Albino Fell Pony comes from full siblings. In order for a chance at an Albino Fell Pony one of these full siblings MUST BE a Fell Pony. 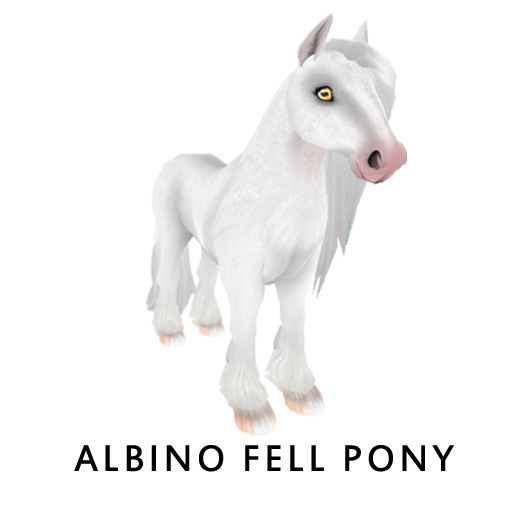 The Albino Fell Pony coat does NOT pass. 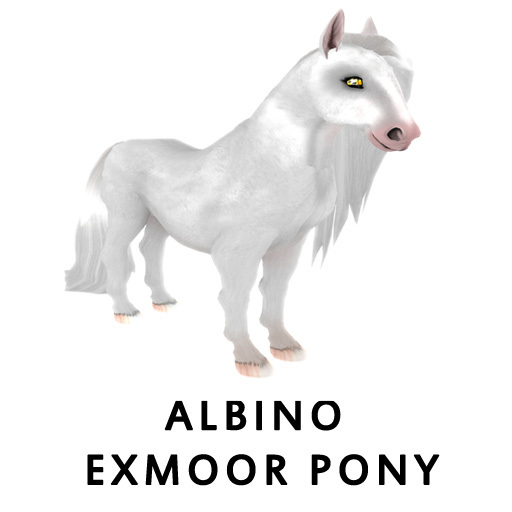 However, breeding an Albino Fell Pony with it’s sibling does slightly increase your chance for another Albino or Albino Fell Pony. 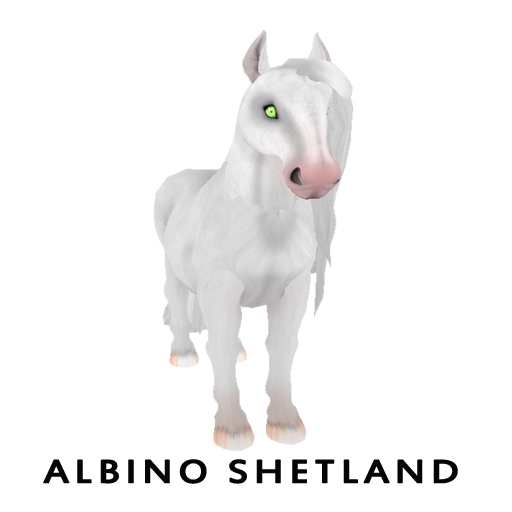 The Albino Shetland comes randomly from full siblings. In order for a chance at an Albino Shetland one of these full siblings MUST BE a Shetland. The Albino Shetland coat does NOT pass. However, breeding an Albino Shetland with it’s sibling does slightly increase your chance for another Albino or Albino Shetland. 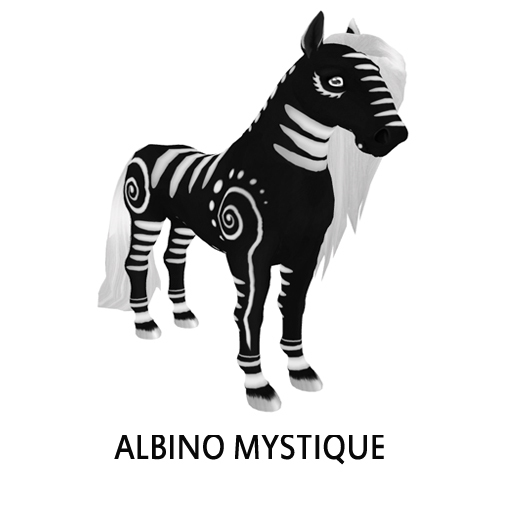 If you breed two Mystique siblings together you have the chance at an Albino Mystique! Full siblings are siblings that come from the exact same mother and father. Siblings do not have to have the same traits they only need to be full sibling Mystique. The Albino Mystique coat does NOT pass. However, breeding an Albino Mystique with it’s sibling does slightly increase your chance for another Albino Mystique. The Albino Exmoor Pony comes randomly from full siblings. In order for a chance at an Albino Exmoor Pony one of these full siblings MUST BE an Exmoor Pony. The Albino Exmoor Pony coat does NOT pass. However, breeding an Albino Exmoor Pony with it’s sibling does slightly increase your chance for another Albino or Albino Exmoor Pony . The Albino Percheron comes randomly from full siblings. In order for a chance at an Albino Percheron one of these full siblings MUST BE a Percheron. The Albino Percheron coat does NOT pass. 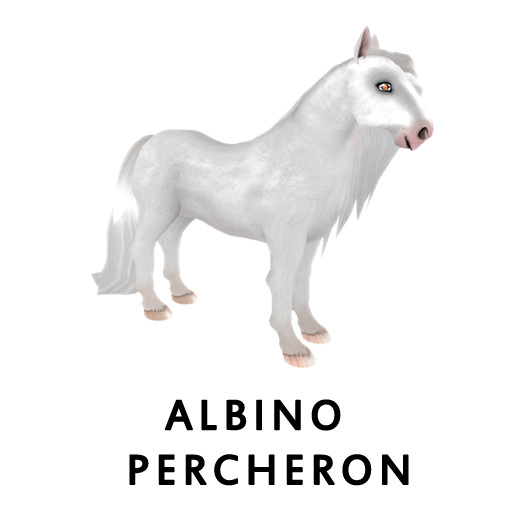 However, breeding an Albino Percheron with it’s sibling does slightly increase your chance for another Albino or Albino Percheron. Good luck getting an awesome Albino and happy breeding! 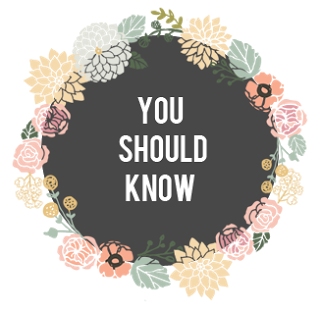 Breeding Terms and things you should know…..
Hello everyone! Hope everyone is having a great Monday! I wanted to talk with you guys about a few breeding terms that you may or may not be familiar with. This weekend sure has gone fast, I hope you all enjoyed it! 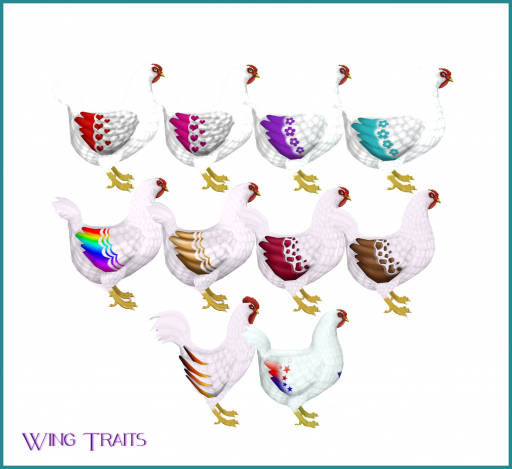 I really love the barnyard birds and today I’m going to take a look at the wing traits. The Wing trait was first introduced by breeding 2 2016 Wild Love Edition Barnyard Birds together!! On April 29, 2016 until May 13, 2016 Amaretto wanted to celebrate all our Mothers, with Happy Mother’s Day 2016 Collectors Edition Barnyard Birds! Any breeding of these Barnyard Birds gave you a chance at the new Wing Purple Flower or Wing Teal Flower! On August 4th, 2016 until August 19th 2016 Amaretto celebrated Summer 2016 with 2016 Summer Edition – Hang Tens! Any breeding of these 2016 Summer Edition – Hang Ten gave you the ability to get a brand new Gold or Rainbow Wing! On Jan 27,2017 Amaretto celebrated ARU Graduates with this Wing A.R.U. that can pass from any 2017 A.R.U. Graduation Edition breeding! On June 26, 2017 until July 19, 2017 Amaretto celebrated 4th of July with Celebrate Independence 2017 Barnyard Birds! You could get a new Wing Celebrate from any breeding of these Celebrate Independence 2017 Barnyard Birds! So be sure to check them out, they definitely accent the breeds nicely. That was all from me today, happy breeding and see you in world. This week in my connection I had the pleasure of learning a bit more about Eccentric. If you see her in the groups or out and about feel free to say hello! Eccentric please tell the community a little about yourself & what brought you to Second Life? I have been in and out of SL for almost 7 years. I am a mother and nurse from Iowa. I was brought to SL by a friend years ago because I am truly a down to earth gaming dork in my free time. I replaced my addiction for World of Warcraft with Second Life. 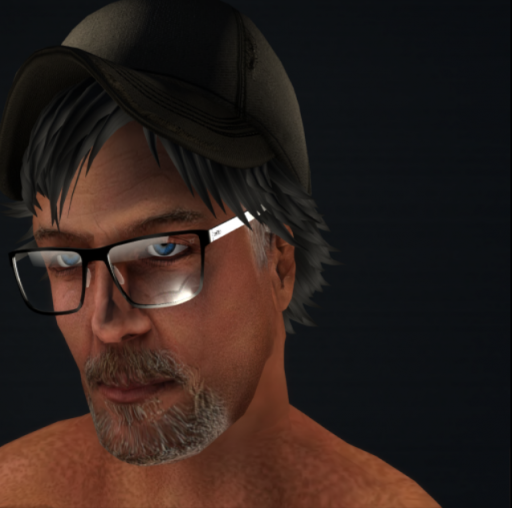 I stayed in second life for the amazing amounts of things you can do and the escape from RL. Currently I breed Amaretto Ponies and Horses. But I have dabbled in the Birds and Dogs as well. I was roaming SL as a newbie and ran into the original cheetah limited edition that was breeding back at the beginning – and I was hooked. It quickly became an addiction and 1 turned into owning 200. At this time I just have Ponies and Horses BUT in the past I have bred fairies, meeroos, turtles, elephants, and about 50 other just for fun breedables. I love breedables and have fun with them but I bore quick and easily so Amaretto is all that has truly kept my interest. 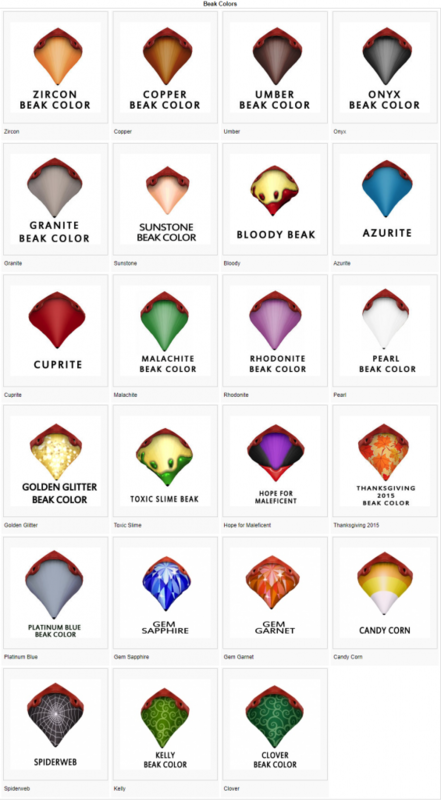 Currently attempting to get my celebrate wings onto a Bluie Fab or Redie Fab with the eyes and long long preferred. Well right now its a tie— Horses I love because I can ride them and just first love with breedables but ponies tie because frankly they make me nostalgic from my childhood and collecting my lil ponies. Dorky I know right! Outside of running Xxtreme Oasis Breedable Ponie Market – photography, building, design, explore & meet new people. I have been very blessed to meet some amazing friends in SL that truly make SL an amazing place to escape and enjoy. Thank you Eccentric for taking the time to share your story and your love of Amaretto! Beaks, Beaks & More Beaks! Hey fellow breeders, it’s Friyay and today I want to take a look at the beak traits in the barnyard birds. As you can see there are many beak traits and they all have a unique look. Whats even better though is you can put all 3 of them together and mix them up and try and make a 3 beak traited bird! That’s it from me today, I hope you all have an amazing weekend and see you all in world in the groups. Goodbye Recovery, Hello Version 1.20! Surprise! Its time to update those ponies again! We have been working on kinks and bugs, Since the ponies were released there have been some issues that were brought to our attention we have been working hard and we are ready to implement some fixes. This update DOES NOT include new content! It is fixes ONLY! If your ponies are in recovery and sleeping don’t make your ponie mad at you let it wake up then update it! We dont want any grouchy ponies! There are a few things you need to remember when updating! I know updating a large herd of ponies can be frustrating or even overwhelming remember your bulk updater. If you have any issues updating please file a ticket and we will have a staff member assist you! Happy updating everyone! This is Ava over and out!! There’s a Group for Everyone! Helloooo fellow breeders! It’s hump day! All groups are for POSITIVE chat and support for the Amaretto community. That abusive behavior and arguing are not tolerated. There is no advertising of any kind (including freebies, giveaways and or trading) in any group other than the Advertising Group. 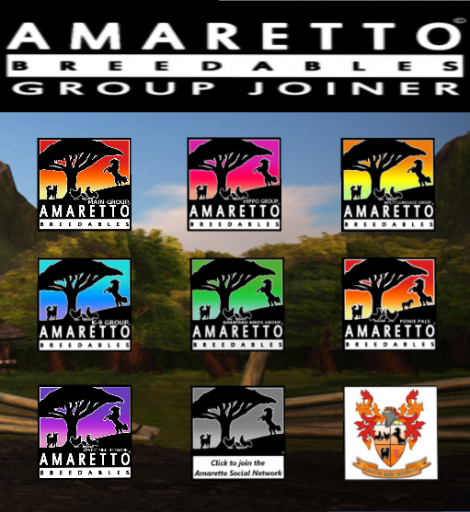 These groups are often monitored by Amaretto Breedables staff as well as group moderators who are there to answer your questions and have a good time. This is Amaretto’s main group chat. In this group you will always find the answers to your questions, people to socialize with, gloat about your latest and greatest breedable and just a place to talk all things Amaretto. 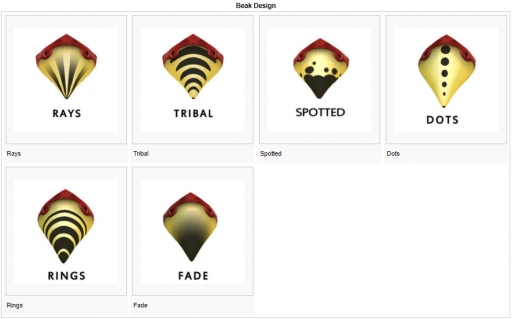 This group is open to all avatars 40 days and older. For those of you who wish not to be in one of our groups for whatever reason we also offer a Hippo Group which we use to send important information as well. This is Amaretto’s main Multi Language Group. 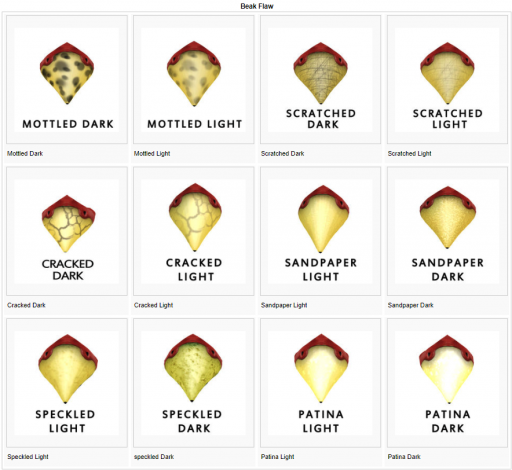 This group is exactly like the main Amaretto Breedables only in the language of your choice. In this group you will always find the answers to your questions, people to socialize with, gloat about your latest and greatest breedable and just a place to talk all things Amaretto. This group was created for Amaretto Ranch K-9 lovers! This group is dedicated to chat about all things K-9 related. If you have questions, suggestions or you’re just looking to chat with others about Amaretto K-9s this is the group for you! This group was created for Amaretto Ranch Barnyard Bird lovers! This group is dedicated to chat about all things Barnyard Bird related. If you have questions, suggestions or you’re just looking to chat with others about Amaretto Barnyard Birds this is the group for you! This group was created for Amaretto Ponie Pal lovers! This group is dedicated to chat about all things Ponie Pal related. 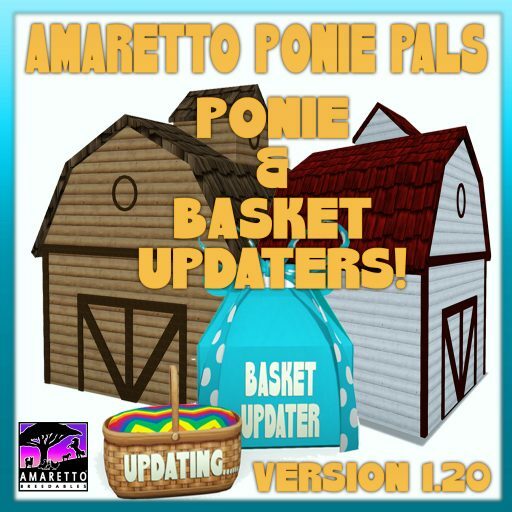 If you have questions, suggestions or you’re just looking to chat with others about Amaretto Ponie Pals this is the group for you! This is where you can advertise your AMARETTO BREEDABLES ONLY for sale. You can chat about your breedables here; post them for sale, for trade and or give-a-way! Feel free to advertise your stores/booths no matter their location. The posting limit for this group is 1 group IM per hour and 1 notice per 2 hours. THE MAXIMUM IS 4 ADS PER DAY! The mission of Amaretto Ranch University is to educate our community on all aspects of the Amaretto products. We believe that to achieve full knowledge of our products means to fully enjoy them. Amaretto Ranch University is provided to the Amaretto community free of charge and is supported by Amaretto Breedables staff and volunteers who believe in this mission and are committed to providing competent and caring guidance to all who seek it. Join today and I hope to see you all in group chat! Happy Tuesday everyone! Today I wanted to take a moment to cover Ponie Oasis with you all! As most of you know, Amaretto Ranch Breedables offers a unique point system for ponies that you no longer wish to keep. Basically all your Ponie Pals have a point value in Ponie Oasis. 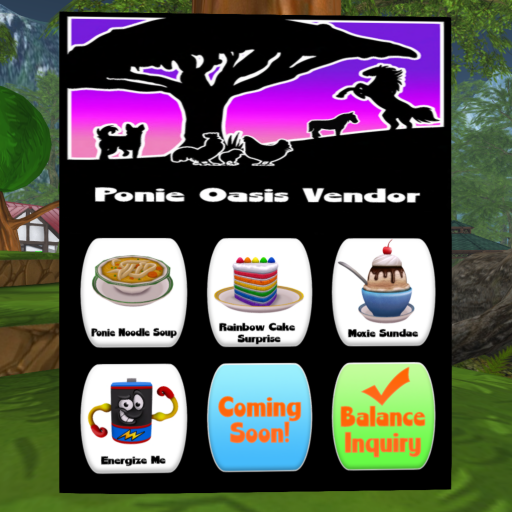 You have to confirm to send a Ponie to Oasis, therefore it cannot be reversed. So make very sure this is something you really want to do. Even if it’s done by mistake it cannot be undone. So please be careful!